This year so far, I have been trying out so much new makeup. I have become so bored of wearing the same brands and the same kind of things all the time, so I have been forcing myself to step out of my comfort zone a little bit. So, now that I have all of this new makeup I thought it would be good to do a new forever favourites post. In these posts I just give you an overall of the makeup that I am loving at the minute. Normally my standard to get into this post is to have repurchased it at least once! So, I won’t ramble on and I will just onto my new favourites! I was very dubious about this foundation when I first bought it. For me, I just thought that something that cheap surely isn’t as good as everybody is making out. I know that may sound a little snobbish, but I don’t mean it like that. I have an oily complexion and normally the drugstore just don’t cater for different skin types. But this foundation worked perfectly for my skin. Honestly, I applied this in the morning around 7am and didn’t have to powder my face once. Since using it I have bought a spare 2 because I really don’t want to run out. When I find a good cheap foundation that works for me I hoard it! I wanted this purely for the packaging because it really is just so stunning. Then I thought I would love the contour shade, which I do. But I had no idea that I would fall in love with the highlighting shade the way that I have. I have never really been a fan of highlighting. There are too many people out there now that highlight their face until they look like a glitterball. I hate that kind of look, for me I either want it to look subtle or I don’t want anything on at all. This highlight shade is just perfect for my skin tone, I am hooked! I have been on the hunt for my holy grail lipstick for absolutely ages. For some reason, I just couldn’t find the perfect neutral shade for my lips. I wanted one that wasn’t too pink or wasn’t too mauve or purple in colour. Then I found this lipstick and fell head over heels for it. Within a month, I had used a full bullet of it which is saying something for me because normally lipsticks last me years. I have been wearing this every single day without fail for months on end and my obsession doesn’t seem to be slowing down either! I am a lover of all things deep. I know that we are heading into spring but I will take a nice deep brown rather than a red any day of the week. 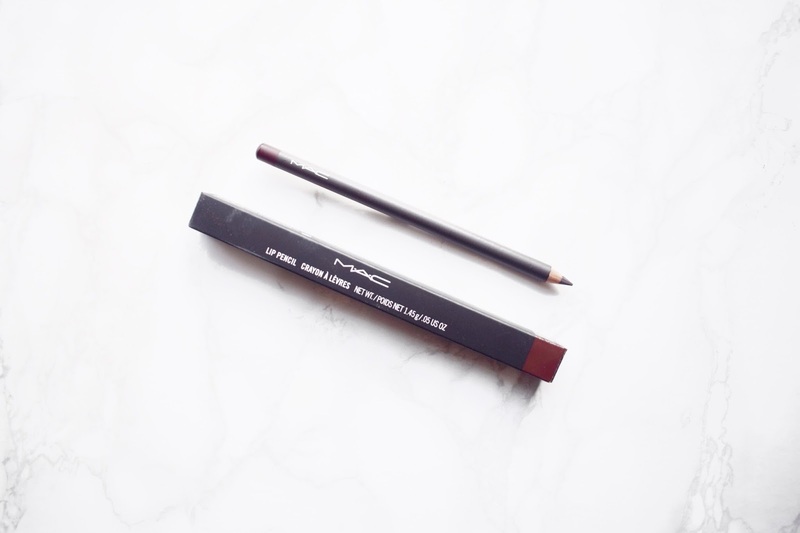 When I first tried this MAC lip liner I loved it straight away. The colour of it is just pure perfection. For the longest time, I had been wearing the MAC Stone Lipstick without having the lip liner and it really has made a world of difference. My lips now just look much more defined and it helps me to overdraw my lips if I want to. As a girl with oily skin I kind of kick myself for waiting so long to try this foundation because it works so well for my skin type. Never have I tried a foundation before that controls my oil as well as this one does. It looks good all day long and only moves or comes off when I want it to. My only bug bear with this foundation is that it didn’t come with a pump, so I did buy a MAC pump and it works perfectly. It is obviously an extra expense on top of the foundation, but it is one of them things and once you have it, you have it! Anybody who knows me knows that I’m not a floral girl. If I had my way I would wear men’s aftershave, but when I have done that in the past before people tend to think I am strange. So, when I found this deep smell I was hooked on it from first spray. I must literally go through one of these bad boys a month because I douse myself in it, not to mention that I spray it around my room and especially on my bed linen to make it smell like Chanel. I honestly think this is my new favourite over the Chanel No5. Never in my life have I used a mascara as good as this one before. I used to be a bit of a scrooge towards mascaras because I could never see how high end ones can differ that much to drugstore ones, how wrong I was. Since trying this none of my old drugstore favourites seem to be performing as well as I used to think that they did. This YSL Shocking Mascara just makes the lashes so much longer and thicker, plus it holds your lashes up all day and really curled because it really does feel like it sets around each individual lash hair. I wanted to try this foundation out to start with because I felt like I was the only person in the whole world that didn’t have it. When I first tried, it was love at first blend. This foundation just makes the skin look so flawless, and at the same time it is nice and lightweight. What I love about this foundation is that it covers my hyperpigmentation. I do have to go in with two layers over my problem area on my cheek but that does the job fine. Normally with liquids I can go in with multiple layers and even that doesn’t cover it. Plus, this is really quick and easy to use with it been in a stick form. As soon as I heard the name ultimate coverage concealer I knew that I had to give it a go. Anything that is full coverage and will hide the darkness under my eyes I need to try out immediately. I have been loving this recently for the area right close to my lash line because that is where I get most of my darkness. Just the smallest amount of this and then blending it out makes my dark circles completely vanish. The good thing about this concealer is that a little bit goes a really long way because it is so pigmented so this small pot will last quite a while! Everybody raves about this product and it actually took me quite a while to try it out. It is just such a good universal shade. Plus, for a lip liner it is really nice and moisturising and doesn’t try my lips out at all which is just what I look for in a lip liner. This lip cheat is great for lipsticks that I don’t have matching lip liners for. This just helps me to guide the lipstick on, plus, even though lipstick bleeding is minimal on me, it still stops it from happening. I think Pillow Talk is just one of them shades that everybody should give a go. There you have my new ultimate forever favourites. Over the past few months I have been using these products to death and I can’t imagine a time when I won’t love them. Every single one of them has been repurchased over the past few months and that just shows how much I love it. As normal I will leave a link down below to everything that I have mentioned. Also, please make sure you leave any questions that you may have below and I will get right back to you. What products are your forever favourites? Some of my favourites are on here too, I love Pillow Talk liner. Definitely need to try that Becca concealer, it sounds amazing! I love the Becca Concealer, I was dubious about it to start but I love it! I know it is sheer dedication to a lipstick isn't it! Of course it't not too late! I always try to save my Boots points but I never seem to get anywhere! It is such a good mascara, I don't think I will ever tire of using it! It is such a good cheap foundation, if I didn't already know I would think it is high end! There are some gorgeous products here, I love that mac lip pencil and I think I have smelt the perfume before, it smells lovely! It is such a good perfume, it is definitely one of them that you either love or hate! I love it too, it is my most reached for foundation by a mile!